A novel sample preparation method for auxin analysis in plant samples was developed by vacuum microwave-assisted extraction (VMAE) followed by molecularly imprinted clean-up procedure. The method was based on two steps. In the first one, conventional solvent extraction was replaced by VMAE for extraction of auxins from plant tissues. This step provided efficient extraction of 3-indole acetic acid (IAA) from plant with dramatically decreased extraction time, furthermore prevented auxins from degradation by creating a reduced oxygen environment under vacuum condition. In the second step, the raw extract of VMAE was further subjected to a clean-up procedure by magnetic molecularly imprinted polymer (MIP) beads. Owing to the high molecular recognition ability of the magnetic MIP beads for IAA and 3-indole-butyric acid (IBA), the two target auxins in plants can be selectively enriched and the interfering substance can be eliminated by dealing with a magnetic separation procedure. Both the VMAE and the molecularly imprinted clean-up conditions were investigated. The proposed sample preparation method was coupled with high-performance liquid chromatogram and fluorescence detection for determination of IAA and IBA in peas and rice. The detection limits obtained for IAA and IBA were 0.47 and 1.6 ng/mL and the relative standard deviation were 2.3% and 2.1%, respectively. The IAA contents in pea seeds, pea embryo, pea roots and rice seeds were determined. The recoveries were ranged from 70.0% to 85.6%. The proposed method was also applied to investigate the developmental profiles of IAA concentration in pea seeds and rice seeds during seed germination. 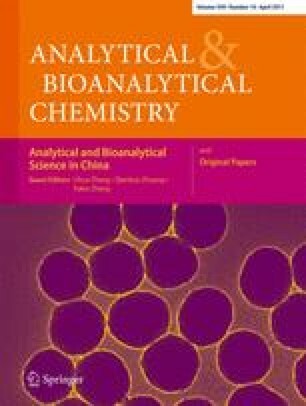 Published in the special issue Analytical and Bioanalytical Science in China with Guest Editors Lihua Zhang, Qiankun Zhuang, and Yukui Zhang. The authors would like to thank the National Natural Science Foundation of China for financially supporting this research under grant number 90817012, 20775095, 20705042 20905080 and 21075140, the Key Program of Guangdong Provincial Natural Science Foundation of China under grant number 9251027501000004, the Science and Technology Planning Project of Guangdong Province of China (No. 2009B010900021), and the Fundamental Research Funds for the Central Universities, respectively.